The Cyfish 33 Lady K K1 rounded Weather Ness shortly after midday and powered in towards the ferry pier at Rapness. Above: The Cyfish 33 Lady K powers into Rapness pier. 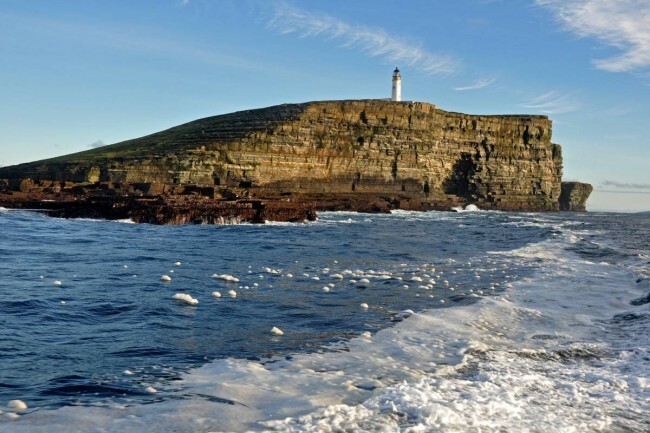 Having left Pierowall harbour at 4am, skipper Heddle Costie and crewman George Kent steamed some 20 miles east across the North Sound before starting to haul leaders of creels shot in the vicinity of the outlying islands of North Ronaldsay and Sanday. Starting at the furthermost point of the day from Westray, Lady K gradually shortened the distance, while working ever-closer to Eday, before returning west across Rapness Sound for a quick pick-up from the pier, as arranged the previous evening. 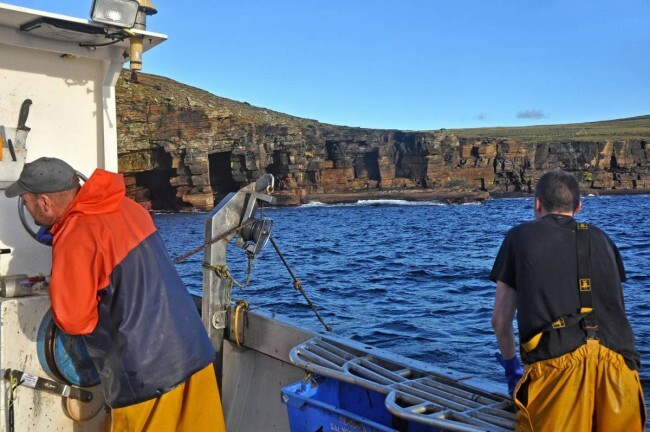 The offer to spend the second half of the day on Lady K within 90 minutes of returning to Pierowall harbour on the traditional South Isles yawl, Bee K70, was gratefully accepted, not least because it would provide a further opportunity to experience the mixed inshore creel fishery that is of paramount importance in Orkney. George Kent and Heddle Costie clearing and rebaiting a 36in parlour creel off Red Head on Eday. Orkney blues and browns together. Pierowall skipper Heddle Costie’s Lady K was built by Cygnus Marine at Penryn in 1997 as Harvester. 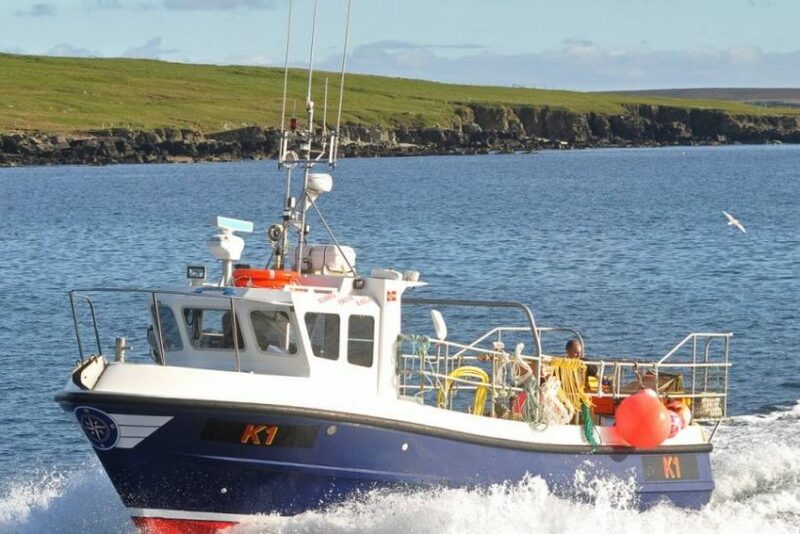 Subsequently renamed Harmony, the Cyfish 33 moved to Shetland in 2001, when Jim Scott of Skeld renamed the semi-displacement boat Deep Harmony LK 375. 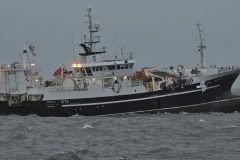 Heddle Costie purchased Deep Harmony in 2014, when she was renamed Lady K.
After quickly recrossing Calf Sound, skipper Heddle Costie eased back the power from the Cummins 6CTA engine as a buff came closer to starboard, before the hydraulics for the Spencer Carter 1t hauler were clutched in. The first leader was shot quarter of a mile from the cliffs of Red Head in 12 fathoms of water. 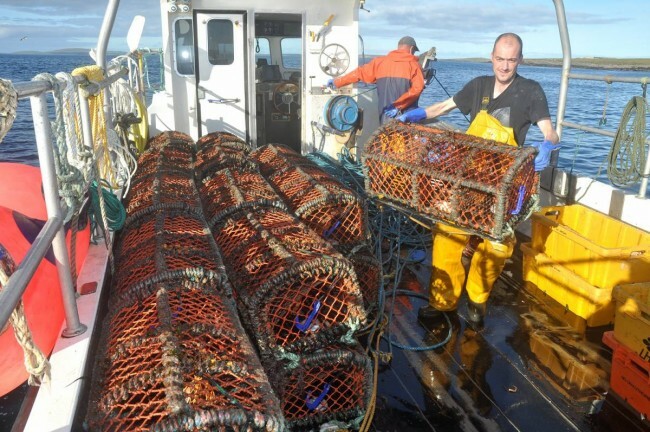 With the main late summer/early autumn lobster fishery rapidly drawing to a close, if not already past, brown crab was expected to dominate the return from this string of gear, with the occasional lobster being a welcome bonus. 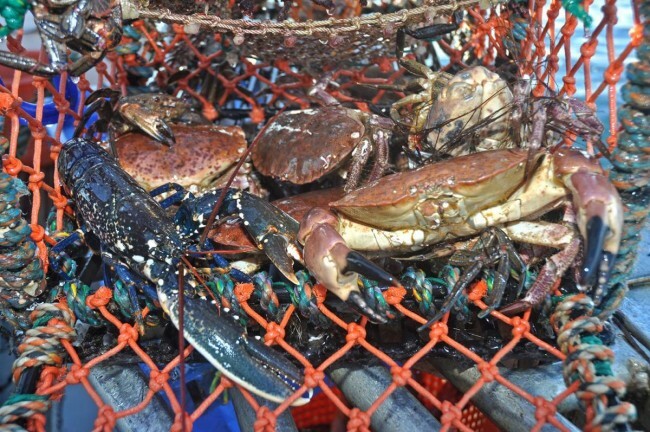 This proved to be the case, with prime Orkney crab, although not particularly abundant, being the dominant species. Skipper Heddle Costie works 36in double soft-eyed parlours, supplied by Caithness Creels, in strings of 25 spaced at 14-fathom backropes. Neatly stacked, parallel to the port side, two-high and three across the beam, parlours were soon self-shot again through the portside opening in the transom, as George Kent put rubber bands on the claws of six average-sized lobsters. The next two sets of gear were hauled from closer in to Eday, across Fersness Bay, in less than five fathoms of water on tangle bottom. 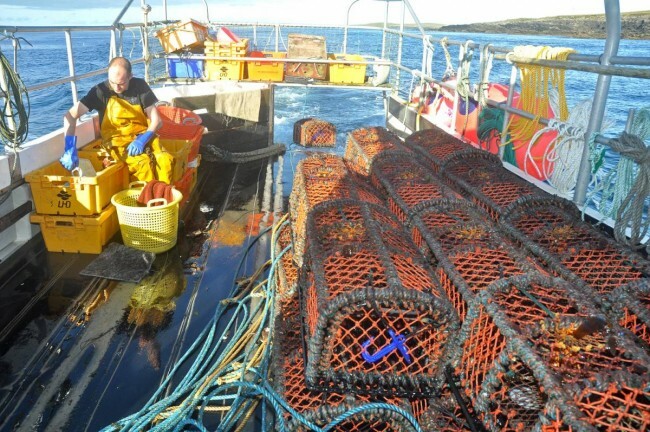 As the parlour creels continued to be taken aboard smoothly, reflecting the experience of the two-man team, skipper Heddle Costie explained that these grounds, which can provide some degree of shelter during periods of easterly winds, are often his ‘go-to’ location towards the end of the year, when demand for velvet crabs is usually at a seasonal high. 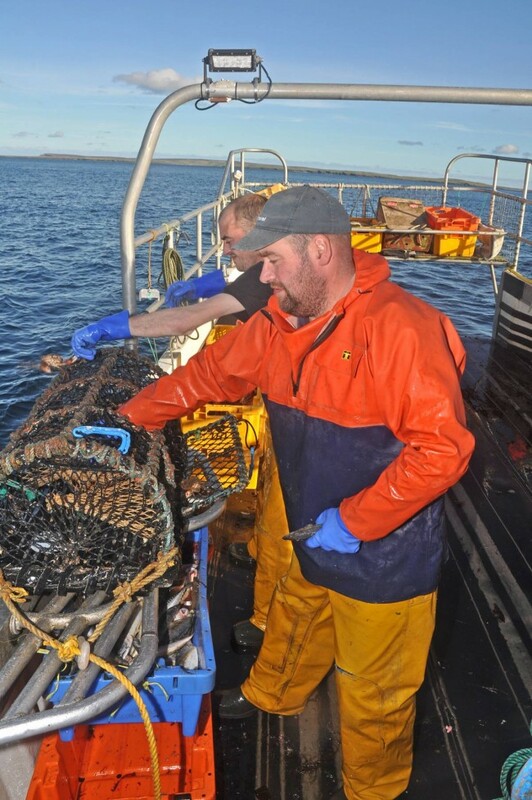 On recent hauls, the tangles had provided a steady sprinkling of lobsters, and although the peak yield was probably past, 19 keepers from 50 creels were still considered worth shooting back again in a similar area. While considerably fewer brown crab were seen, greater quantities of velvets were consistently present when the end of the parlour was opened up. Rather than keeping velvets above the MLS of 65mm, every one was thrown back on being cleared from the creel. “These represent our Christmas bonus, so better to catch them when market demand is at its peak towards the end of the year, when they will probably bring at least double their current value, if not more. 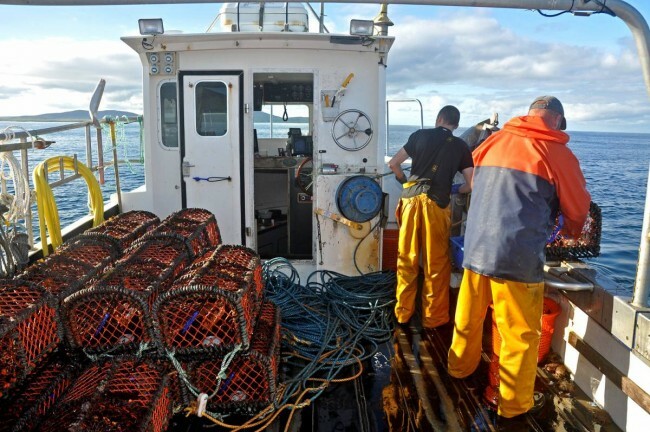 The short December days reduce fishing time to a minimum, so returning velvets now, while we are fishing lobsters, represents money in the bank later on. 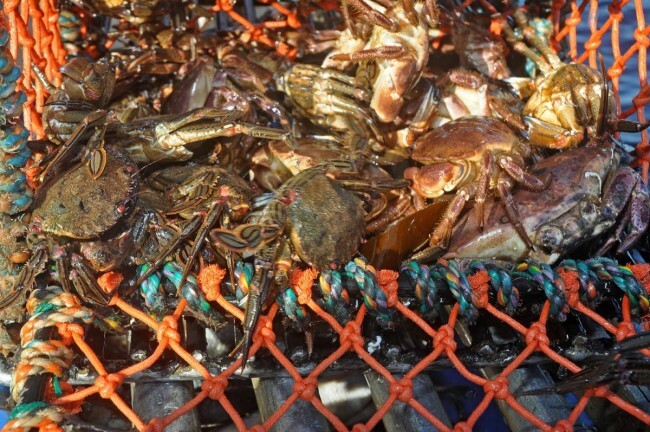 We know they are there, as they will be again in two months, when their value has increased,” Heddle Costie said, as he continued to return up to eight velvet crabs taken from some creels. After hauling a fourth leader of parlours, shot further south towards the aptly-named Sea Skerry, the inhabitants of which were none too pleased to be disturbed from their slumbers, Lady K headed north-west into the Westray Firth towards the Points of Huro and Neven, and the next leader, located near Whart Holm and The Clumps, in deeper water some three miles off the land. 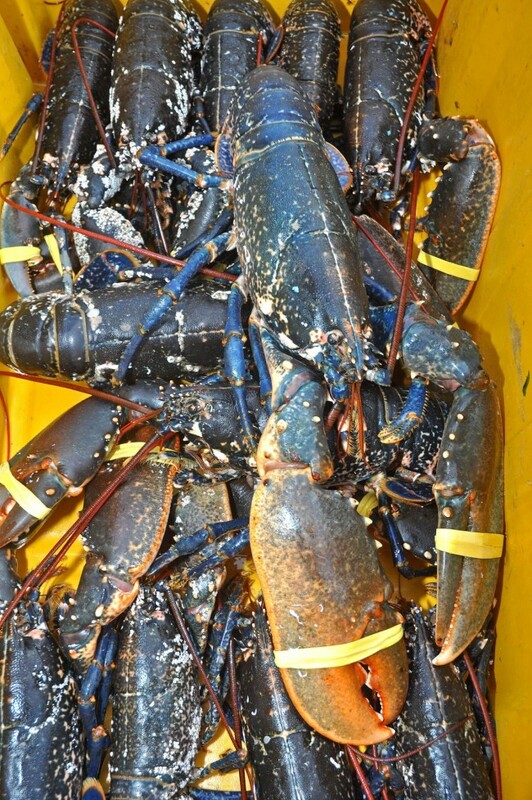 The reduction in the number of lobsters from this leader was partly offset by a general increase in average size. Hauling static gear towards the middle of Westray Firth, at times on the edges of tide rip, small areas of broken water – which had appeared from nowhere in an otherwise calm sea as a strengthening ebb tide flowed over shallow bottom – gave a small reminder of how dangerous this passage can be, with currents of seven knots not being unusual. As the afternoon progressed, Lady K headed back towards the west coast of Westray, where the next two sets of gear were fishing on hard grounds well inshore, near Langskaill and Berst Ness. Lady K rounds Noup Head lighthouse on a fine October afternoon. 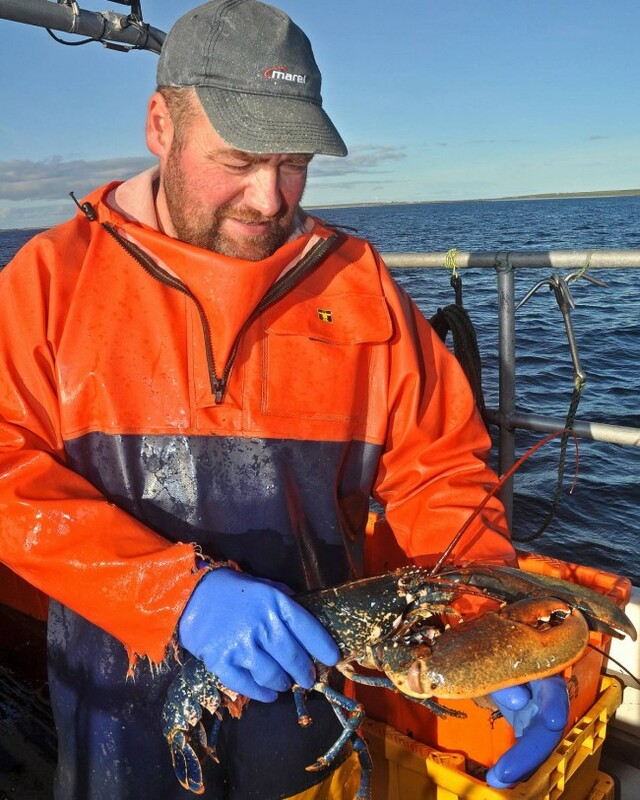 Heddle Costie with a fine Orcadian male lobster. Hauling the tailing for the last string of the day, as the Noup Head cliffs start to rise up. 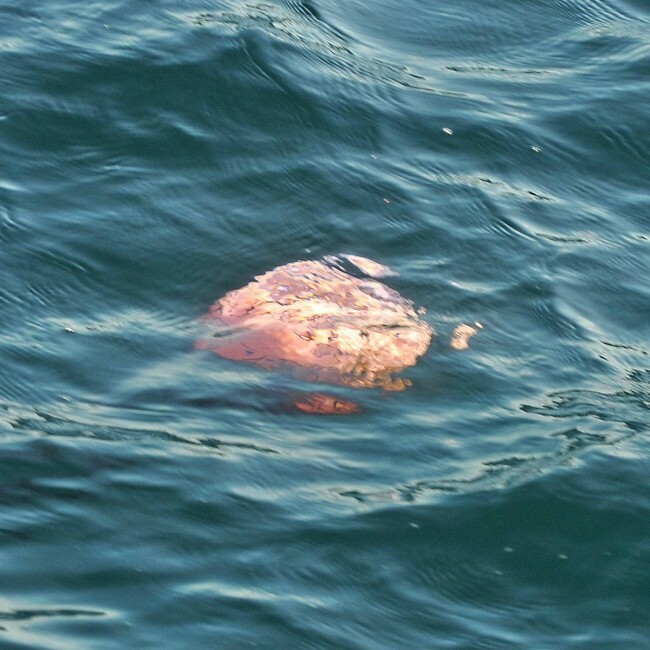 Dahns are often well underwater when fishing in Westray Firth, where tides of seven knots are commonplace. 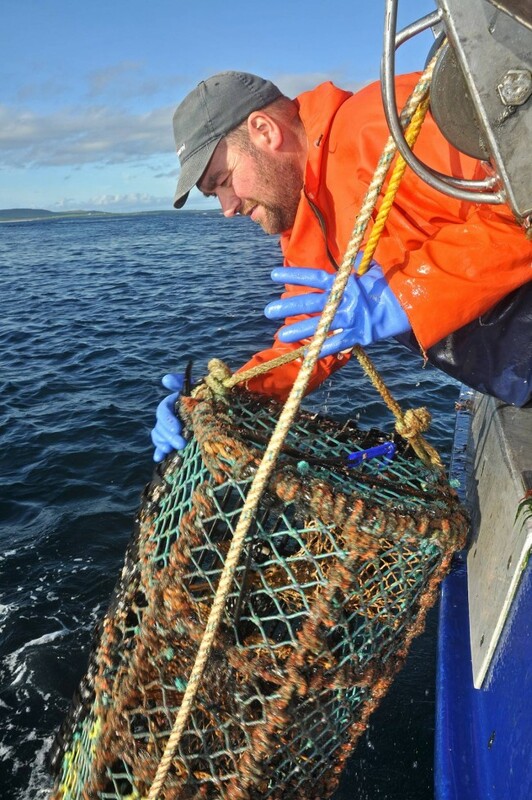 Quality (and local knowledge) counts, with a good-sized class of lobster ready for the store tanks. 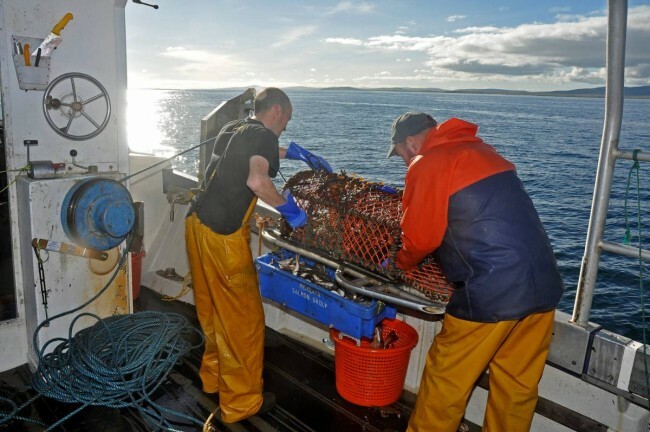 Again, the quality of lobsters outweighed their quantity, although skipper Heddle Costie was fairly satisfied at the way a typical day of steady accumulation, was turning out. Leaving Inga Ness to starboard as Lady K steamed parallel to the coast, the shoreline began to take on a very different look, as the previously low-lying fields were quickly replaced by the dramatic sheer rock faces of Noup Cliffs, which at their peak tower 76m above the sea and are home to Orkney’s largest seabird colony. When the twelfth and last leader of the day had been hauled, cleared, rebaited and shot away again near the Gentleman’s Cave, Heddle Costie steamed Lady K round Noup Head lighthouse and across the Bay of Noup, before rounding Bow Head to run south through Papa Sound for Pierowall harbour. 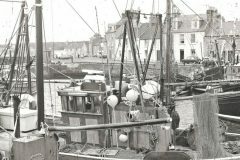 Thirty minutes later, the day’s return of two slack boxes of lobsters and five boxes of brown crab were hauled up the quay, shortly before the rest of the Pierowall fleet returned to harbour to land as darkness descended. Thanks Heddle and George for lengthening your day to make this feature possible.